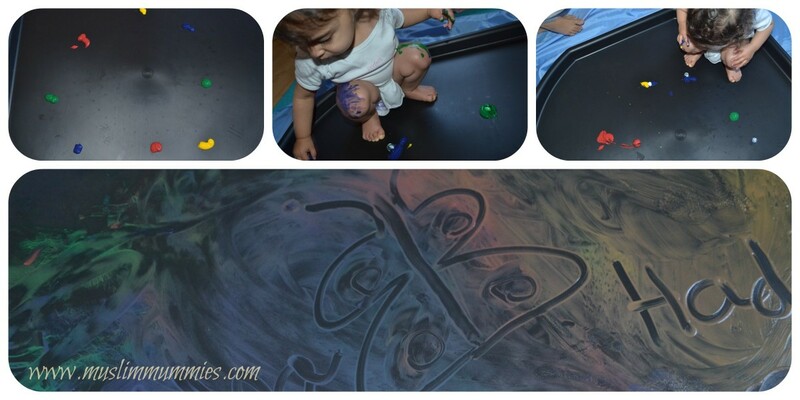 Tuff Spot Messy Play with Paint! 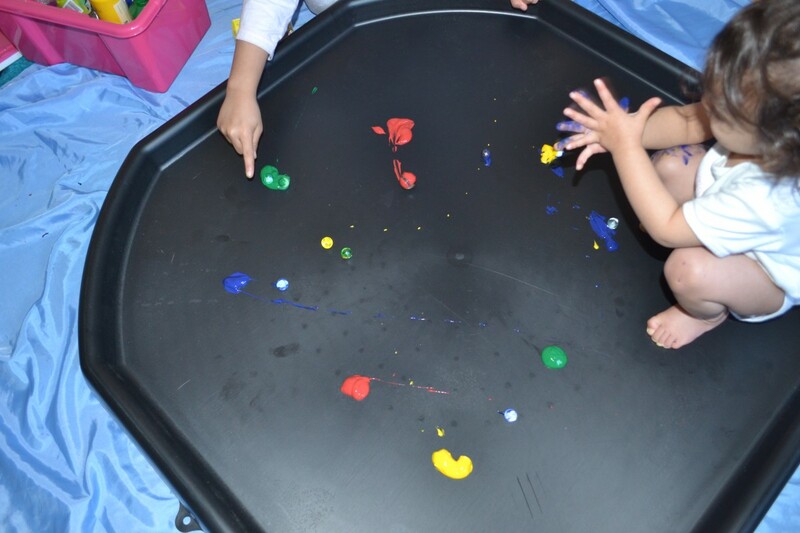 How about some messy play? Those 2 words, ‘messy play’ would strike fear into me and I would go all pale and start sweating. My legs would turn to jelly and I would need to sit down and take deep breaths. OK maybe not that dramatically but I am not a fan of messy play. 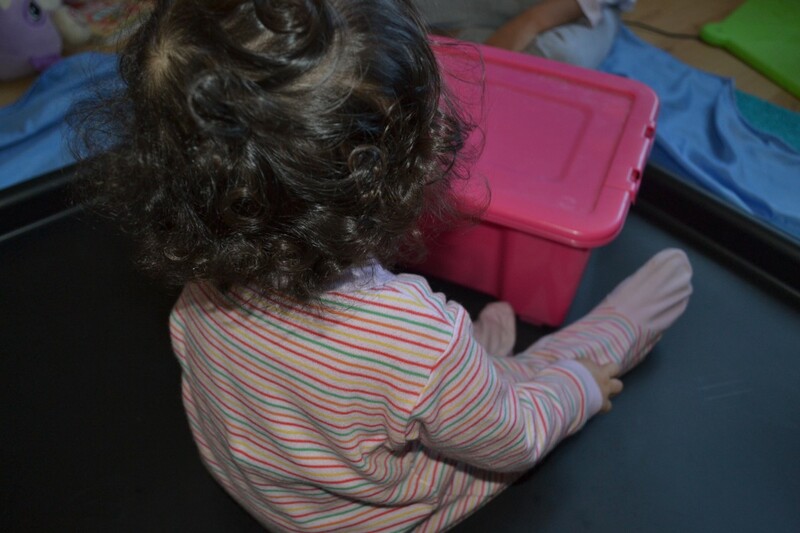 I remember once taking Munchkin to a baby group and it was messy play. She got soaked, fell and banged her head while running because it was so slippy and I vowed never to take her to another messy play group again. The most Bee has done is play with sand and flour at baby group. However, I have been inspired by fellow bloggers with their Tuff Spot’s and messy play as their kids look like they are having so much fun. So I decided to be brave. Would I live to regret it?! One of the idea’s I saw which I thought probably wouldn’t get too messy was putting paint on the tuff spot and rolling balls and marbles through it. I should have realised that this may not go to plan when Bee immediately sat in the tuff spot. We put blobs of paint in the tuff spot…..and immediately Bee wanted to get in. I had had the sense to remove her pyjamas thankfully. So then playing with the marbles and having pretty patterns as seen on Pinterest didn’t materialise….I ended up with a baby covered in paint. However, she was grabbing the marbles and throwing them which is good for developing her motor skills and Munchkin and I discussed the colours and mixing them to make other colours. 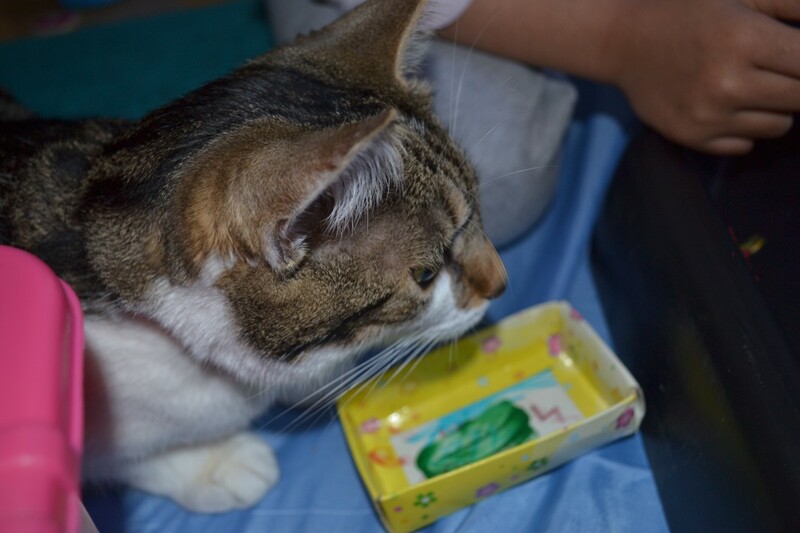 The main thing is that the girls had fun and even the cat was ready to pounce on the marbles in the paint. Thankfully she didn’t and waited until a marble fell out. Can you imagine cat paws in paint all over the house?! good job the cat did not get in, I can imagine she would be a nightmare to clean even more than paint coloured children! That looks like so much fuuuuuun! Things don’t always pan out the way you think, but the end result was great. Has the paint come out of the vest and did the cat avoid the paint?? Looks like lots fun. Yes I soaked the vest for over 24 hours lol and it has come out. Managed to stop the cat from pouncing in! How brilliant, looks like such great fun. Our toddler makes a huge mess at nursery and we do some at home, she would so love one of these! Brilliant – I have to admit I’m not too keen on the massive messy options – we have a local centre that does stuff like this and I jump on it there! Ha ha ha ha! Pinterest has a lot to answer for doesn’t it.She does look like she had fun though which is what counts the most. Did her baby gro come out clean? Yep I managed to get it clean by soaking it for hours and then sticking it in the washing machine! Well done for being brave and giving it a go! We have a tuff spot and I love it. It hasn’t been getting much use recently but I’m planning to change that soon. Have fun getting messy! They do look like they had fun but still think you’re brave. I’d be having palpitations – I avoid paint and children together if at all possible!! I have to admit I was ok with messy play until I had twins!!! Then we had to lay everything out to start with, so the clean-up was easy and fast!!! Although it looks like great fun it brings me out in a cold sweat just thinking about messy play. Well done for being so brave! Wow I wish I’d come across the Tuff Spot when my son was little – it would have been a great way to protect the floor while he made a mess! I know exactly what you mean by being scared of messy play! It is the thought of cleaning up after that has me breaking out in a cold sweat. Right, that’s it – I’m ordering a TuffSpot right now! haha bet the cat wanted to join in too! mashaAllah, very cute.